Today’s cow laid an egg! We’re avid readers at our house and visit our local library once or twice a week to refresh our current stock of books (for children and grown-ups alike). Somehow we always manage to borrow more books than we return, so once in a while (usually when we reach 100 borrowed books), I go through the drawers we keep all the books in and decide what to bring back to the library. I try to do this filing while the kids are sleeping, or else they don’t let me return anything. We’ve read these two books over and over and the kids love them, for a good reason. They’re hilarious! 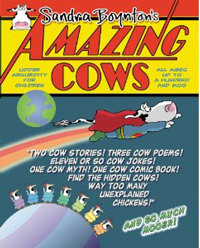 In “The cow that laid an egg”, Marjorie the cow would like to do something extraordinary in her lifetime so the chickens decide to help her out and place an egg next to her while she’s asleep. When she wakes up, she believes she’s laid an egg, and so does the farmer, who calls a bunch of reporters to document the event. The other cows smell something fishy and decide to wait until the egg hatches to prove their point. But when the baby chick comes out of its shell, the first thing coming out of his mouth happens to be “Moooooo!”, proving to Marjorie he is her baby. Of course! In “The cow that was the best moo-ther”, Marjorie and the other cows enter the farmer’s wife contest for the cutest baby cow. 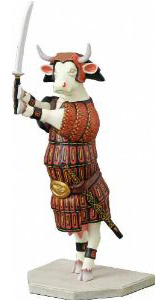 Don’t ask me how, but Marjorie ends up winning a special trophy for “best moo-ther” by the bull! If you’re a parent of little ones, I definitely recommend these two books for a good laugh. As for us, we’ll have to find another book with cows to read tonight, because these two are now back at the library! Previous Post Dress in style, wear a cow belt! You can’t help but root for Marjorie. I don’t know how many items we’re allowed but at least 100, obviously! We can renew them as long as we want too, unless someone else requests them. So I have some books I’ve renewed 5 or 6 times and that’s why I go through our stock every couple of weeks. But if the kids see the bag going back to the library, they always manage to pull some books out to keep!